When you sit down to take the SAT Chemistry Subject Test, the periodic table may well be your best friend. Why? Well, first, it is one of the few tools you'll be allowed to use on test day. Second, it can help you answer quite a few different types of test questions. We just saw how to use the periodic table to figure out an atom's electron configuration, and we'll now take a look at how it can help you predict how atoms will bond. This chapter will discuss the chemical families, periodic trends, different types of bonds, and molecular shapes. We've already seen that elements are arranged on the periodic table from left to right in order of increasing atomic number (except, of course, for the f area elements, which are alone at the bottom). We've also noted that the periodic table can be divided into four regions: the s, p, d, and fareas. By arranging elements in both of these ways, two important themes emerge. 1. Elements in the same period (horizontal row) have electrons in the same energy shells. 2. Elements in the same group (vertical column) generally have similar chemical and physical properties. Let's look at these ideas a little more closely, one at a time. The first period on the table consists of just hydrogen and helium. Both of these elements have electrons in the 1st energy shell. Since the 1st energy shell consists of one 1s orbital, it can hold only 2 electrons, so the third element, lithium (Li) has an electron in the 2nd energy shell. So do Be, B, C, N, O, F, and Ne. These elements make up the 2nd period, and their 2nd energy shells are filled. Third-period elements from sodium (Na) to argon (Ar) fill up the 3rd energy shell. Now, you may ask: What about elements in the d area, such as iron (Fe)? Doesn't iron have valenceelectrons in the 3d subshell of the third energy shell? Well, it does, but iron also has 2 electrons in the 4s subshell. It's an element in the 4th period, and it has electrons in its 4th energy shell. Valence electrons are the most important electrons in an atom because they can participate in chemical bonds. Since chemical reactions involve bond breaking and bond making, the behavior of valence electrons is responsible for all the chemical reactions you see, from the souring of milk to the burning of rocket fuel. Thus, it makes sense that if two elements have atoms with the same number of valence electrons, they will react similarly. And in general, this is true. 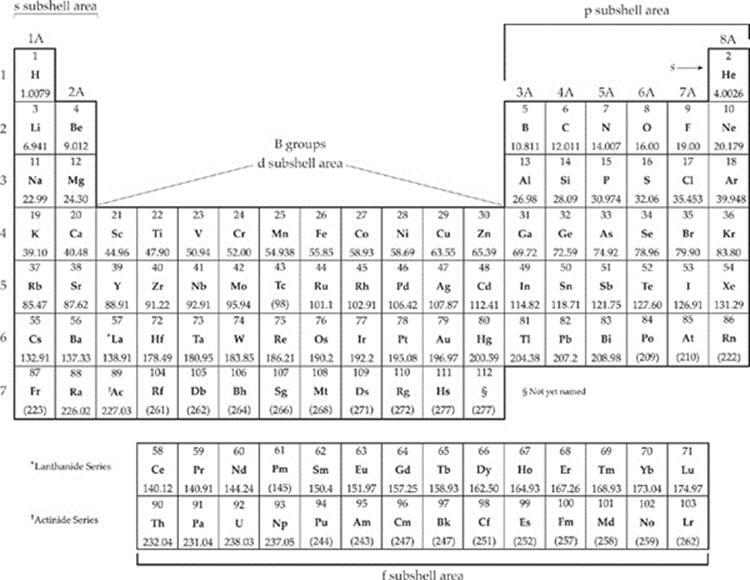 We mentioned that all of the atoms of elements (except helium) in the extreme right-hand column of the periodic table (the noble gases) have 8 valence electrons. Do they have similar reactivities? Yes. These elements (including helium) are all very unreactive and are said to be part of the noble gas family. A family is a collection of elements from the same vertical group that have similar chemical properties. Not surprisingly, all of the members of a particular family have the same number of valence electrons. There are other important families of elements. All of the atoms of elements in the extreme left-hand group on the periodic table have 1 valence electron (in an s subshell). With the exception of hydrogen, these elements—;from lithium (Li) to francium (Fr)—;also have much in common. Chemically, all are extremely reactive. (A piece of potassium, for example, will produce a violent reaction if placed into water.) Physically, they are shiny, grayish-white metals. However, they melt more easily than the metals you're used to seeing, such as iron or copper. They also tend to have lower densities than the more common metals. The elements in the first column, from lithium (Li) to francium (Fr), are placed in the family of alkali metals. The elements of the group to the right of the alkali metals, from beryllium (Be) to radium (Ra), constitute another family—;the alkaline earth metals. The alkaline earth metals have 2 valence electrons. They are less reactive than the alkali metals but more reactive than common metals such as iron and copper. They look a lot like alkali metals. Because of their highly reactive nature, elements of the alkali and alkaline earth families are collectively known as the active metals. The group of elements alongside the noble gases make up another important family of elements—;the halogens. All of the halogens are very reactive. These elements are quite physically distinct from one another: Fluorine (F) and chlorine (Cl) are greenish-yellow, toxic gases; bromine (Br) is a brown liquid at room temperature; and iodine (I) is a grayish-purple solid. So what makes these elements a family? All have 7 valence electrons, so they have similar chemical properties. All of the groups on the periodic table are indicated by a combination of a number and a letter. For instance, the alkali metals group is designated 1A. The alkaline earth metals group is 2A. All of the groups in the d area have a designation that ends in a B. To the right of the d area, designations ending in A resume. The group containing aluminum is 3A, and so on up to 7A (the halogens) and 8A (the noble gases). Notice that for the A groups, the number represents the number of valence electrons possessed by elements in that group. So a lithium atom (1A) has 1 valence electron, a carbon atom (4A) has 4 valence electrons, and an iodine atom (7A) has 7 valence electrons. All elements can be classified as being either a metal, nonmetal, or semimetal (also referred to as a metalloid). Let's start by talking about metals. Metals share certain physical characteristics. They are usually shiny and are good conductors of heat and electricity. Many metals aremalleable, which means they can be hammered into thin sheets such as aluminum foil. Metals are also often ductile, which means that they can form wires. (Copper, for example, is ductile.) With the exception of mercury (a liquid), all metals are solid at room temperature. While these characteristics are noteworthy, there is one chemical characteristic that, above all else, makes an element a metal. Metals tend to give up electrons when they bond. Roughly 75 percent of the elements are considered to be metals, and metals can be further divided into active and transition metals. The reactive metals of the s area are classified as active, while the rest are classified as transition metals. 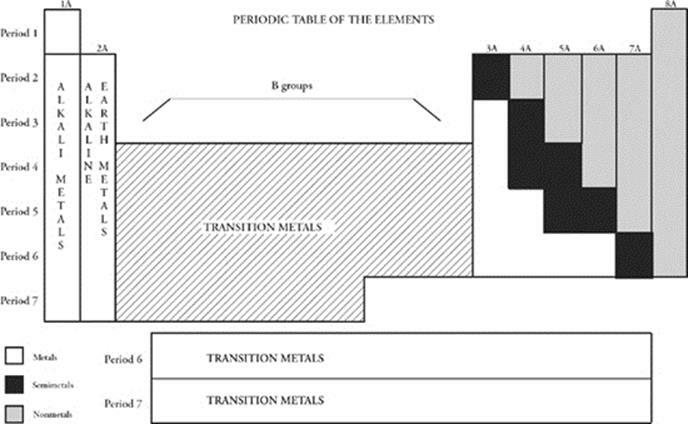 Transition metals are quite different from active metals. They are generally harder, more difficult to melt, and less reactive than active metals. Transition metals include those elements in the d and f areas. Many of the elements that come to mind when we think of metals are transition metals such as iron, copper, gold, and silver. Many compounds that contain a transition metal are intensely colored. For instance, many copper compounds (but not the element itself) are blue. Nonmetals are elements that tend to gain or share electrons when they bond. This distinguishes them from metals. Nonmetals are usually poor conductors of heat and electricity, and some such as sulfur (S) and phosphorus (P) are solids at room temperature. Unlike metals, they are dull, brittle, and melt easily (although diamond, which is composed of the nonmetal carbon, is an exception to these rules). A few nonmetals, such as oxygen (O) and fluorine (F), are gases. The nonmetal bromine (Br) is a liquid at room temperature. As you can see, the physical properties of nonmetals vary considerably. Semimetals, or metalloids, have some of the physical characteristics of both metals and nonmetals. For instance, silicon (Si) is shiny like a metal but brittle like a nonmetal. Appropriately enough, semimetals lie in-between metals and nonmetals on the periodic table. The diagram below summarizes key families and regions on the periodic table. For the SAT Chemistry Test, you'll need to know about four important trends seen in the periodic table. Ionization Energy Because the atomic nucleus contains protons, nuclei are positively charged; the attraction between opposite charges is what keeps the negatively charged electrons in their orbitals. In order for an electron to be extracted from an atom (which creates a positively charged ion), energy must be expended. For any atom, the amount of energy required to remove an electron from an atom is called the ionization energy. As you move from left to right across the periodic table, ionization energy generally increases; it gets much harder to remove an electron from the atom. 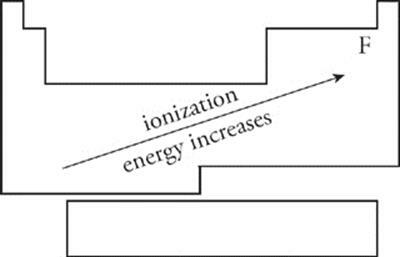 As you move from top to bottom through a column (group), ionization energy decreases. Also, it is much harder to remove each successive electron from an atom; the energy required to remove an inner (nonvalence) electron from an atom is incredibly high because these electrons are very strongly attracted to the atom's nucleus. For the exam, remember that ionization energy increases from left to right across the periodic table as you move up through a group. Ionization energy increases as you move towards fluorine. Electronegativity An atom's electronegativity value refers to the amount of “pull” that an atom's nucleus exerts on another atom's electrons when it is involved in a bond. Atoms of different elements typically have different electronegativities. As you move across the periodic table from left to right, electronegativity increases. 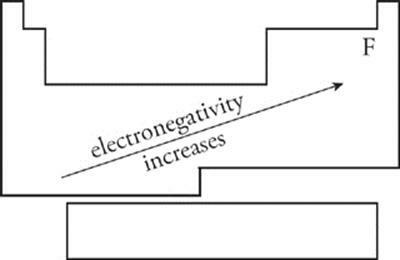 As you move down a column (group) on the periodic table, electronegativity decreases. Electronegativity increases as you move towards fluorine. Atomic Radius We can think of an atom as being roughly spherical, with the nucleus at the center of the sphere. Electrons move about in orbitals within the sphere. Every atomic sphere has a radius, which is known as atomic radius—;the distance from its center to the edge. The larger the atom, the greater its radius. As you move across the periodic table from left to right, atomic radius decreases. 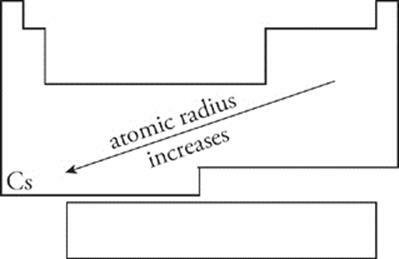 As you move down a group (towards cesium), atomic radius increases. 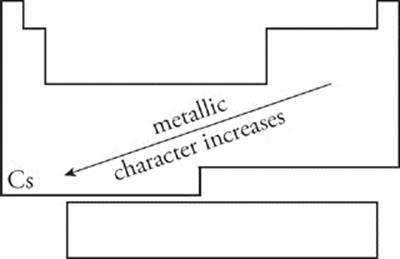 Metallic Character Metallic character is a measure of how easily an atom gives up electrons to form a positive ion. As you move from left to right across a period, metallic character decreases. As you move from top to bottom down a group (towards cesium), metallic character increases. Review what we've said about the periodic table, and tackle the following questions. The answers can be found in Part III. Questions 11–13 refer to following. 39. Which of the following metals is most reactive? 42. Which one of the following is NOT true regarding nickel, N? (D) It is an insulator. (E) It forms colored compounds. 51. Which of the following represents an ordering of the period 4 elements bromine (Br), calcium (Ca), krypton (Kr), and potassium (K) by increasing atomic size? Not surprisingly, the SAT Chemistry Subject Test will want you to know something about bonding—;that is, the way atoms join to form molecular or ionic compounds. You'll need to remember, first of all, that bonding usually occurs because every atom in the bond would like to end up with 8 electrons (a stable octet) in its outermost shell. 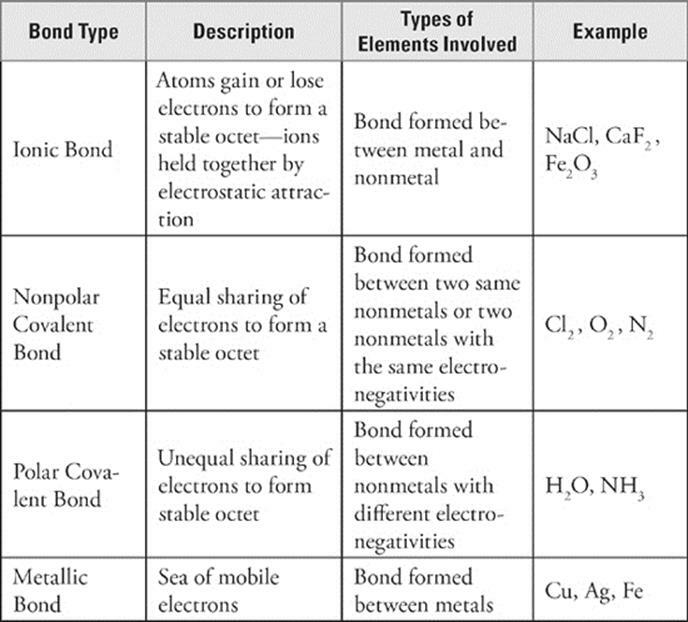 There are three main types of bonds: ionic, covalent (nonpolar covalent and polar covalent), and metallic. When an atom in a bond gives up 1 or more electrons to the atom it bonds with, an ionic bond is formed. Ionic bonds generally form between atoms that differ significantly in their electronegativity values. The atom that gives up the electron becomes a positively charged ion, and the one that accepts the electron becomes a negatively charged ion. The positively charged atom attracts the negatively charged atom, and this draws the two atoms together and results in the release of energy. One term you should be familiar with for the test is lattice energy—;the lattice (binding) energy of an ionic solid is a measure of the energy required to completely separate a mole of a solid ionic compound into its separate ions. So, the higher the lattice energy, the stronger the ionic bond. But what about chlorine? Having gained an electron, chlorine also ends up with 8 electrons in its outermost shell. Its electron configuration looks like argon's. The bond that results creates sodium chloride: NaCl. The attraction between a positive charge and a negative charge is called anelectrostatic force; this force is very strong. The strength of an ionic bond gives ionic compounds their high melting points, hardness, and other physical properties. When a metal and nonmetal bond, the result is an ionic bond, in which the atoms are held together by an electrostatic attraction between a positive and a negative ion. When an active metal and nonmetal bond, it is easy to predict the empirical formula of the resulting ionic compound. For example, suppose calcium and fluorine atoms bond. Since we have a metal and a nonmetal, these atoms will form an ionic compound. Now, ionic compounds consist of ions, but what ions will be involved? Calcium atoms have 2 valence electrons, and since calcium is a metal, it will give up its valence electrons to achieve a stable octet. It gives up 2 electrons to form a Ca2+ ion when it bonds. Conversely, fluorine atoms have 7 valence electrons. Since fluorine is a nonmetal, it will achieve an octet by gaining electrons. So each fluorine atom gains 1 electron (from calcium) to form a F− ion. To get the empirical formula of calcium fluoride, begin by writing the cation and anion (in that order) next to each other: Ca2+ F−. Now drop the “+” and “–” signs: Ca2F1. Finally, take the number next to the metal, and write it as the subscript of the nonmetal and vice versa to get the subscript for the metal. Thus, the empirical formula of calcium fluoride is Ca1F2, which we write CaF2. If magnesium and oxygen were to bond, we would get the ions Mg2+ and O2–. This would make the empirical formula of magnesium oxide Mg2O2, which reduces to MgO. Substances that are held together by ionic bonds are solids at room temperature and atmospheric pressure. Ionic solids are characterized by their hardness, brittleness, and high melting points. Although ions are charge carriers, ionic solids cannot conduct electricity because their ions have very restricted movement. However, if an ionic solid is melted, its ions are freer to move, and the substance can conduct electricity. When two nonmetals bond, the result is a covalent bond. In a covalent bond, two atoms share electrons. By sharing electrons, each atom can achieve a stable octet. In fact, atoms form covalent bonds simply because it's a way for them to obtain a stable octet. When two nonmetals share electrons equally, they are said to be nonpolar covalent. This occurs when the two atoms bonded are the same or have similar electronegativities (or an equal “pull” for electrons). Look how two oxygen atoms bond to form a molecule of O2. The dots signify oxygen's 6 valence electrons. Now, if each atom could somehow acquire two more electrons, it would have a stable octet. So what happens? Each atom donates a pair of electrons, and the shared pairs are attracted to the nuclei of both atoms. In a sense, each atom has 8 valence electrons instead of 6. Each atom is happy. The sharing keeps the atoms together because each atom now has a stable octet. Think about a water molecule. It's made of 2 hydrogen atoms and 1 oxygen atom. Each hydrogen atom has 1 valence electron, which it shares with oxygen. The oxygen atom donates 2 electrons to be shared with the hydrogen atoms. Then what happens? Basically, each hydrogen atom acquires an electron and has a configuration like helium's (which is very stable), and the oxygen atom acquires 2 electrons and has an electron configuration like neon's (an octet). But oxygen's electronegativity is greater than hydrogen's. Oxygen “hogs” the electrons it shares with hydrogen, and the shared electrons spend more time around the oxygen than they do around the hydrogen. The result? Each hydrogen atom has a partial positive charge, while the oxygen atom has a partial negative charge. When, in a covalent bond, certain atoms have a partial positive charge and others have a partial negative charge, we say that the covalent bond is polar. 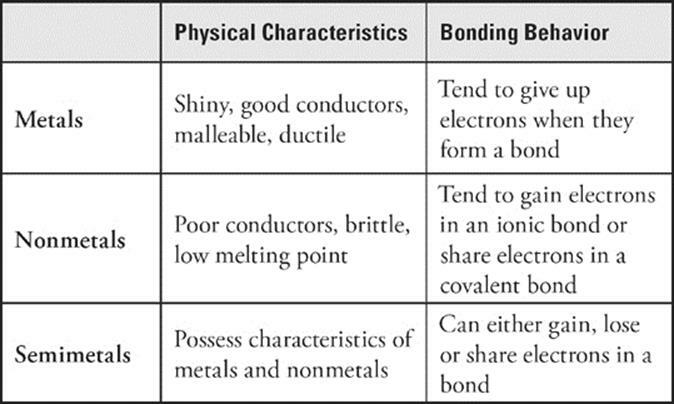 As you've probably guessed, a metallic bond results when two metals bond. For example, the copper atoms that make up a copper wire are joined by metallic bonds. In metallic bonding, the metal atoms donate valence electrons to become cations. These valence electrons are not directly transferred to another atom as they are in ionic bonding. Instead, they move about freely throughout the sample, producing an attractive force that keeps the metal cations in place. Often the behavior of these free electrons is referred to as a “sea of mobile electrons.” Because of the motions of the free electrons, metals are characteristically good conductors of electricity and heat. So far, we've considered covalent bonds in which one pair of electrons is shared between two atoms; these types of bonds are also called single bonds. In the structural formula of a compound, a single bond is represented by a single line. For example, water has two single bonds. Naturally, different bonds have different strengths. For instance, the bond between a carbon atom and an oxygen atom is stronger than the bond between two chlorine atoms. When a bond is relatively strong, we say its bond energy is high. Bond energy refers to the amount of energy it takes to break a bond. 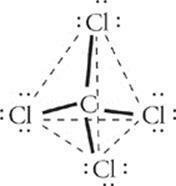 Since a C–O bond is harder to break than a Cl–Cl bond, the C–O bond has higher bond energy than the Cl–Cl bond. Chemical reactions involve the breaking of bonds in the reactants (which requires energy) and the formation of new bonds to make products (which releases energy). If we know which bonds are to be made and which are to be broken, and we know their respective bond energies, we can estimate ∆H for the reaction. Step 1: Assume the first atom in the formula is the central atom of the structure (unless it is hydrogen, which is never a central atom). Step 2: Using dots to indicate the valence electrons of each atom, surround the central atom with the others, trying to give each atom an octet. Remember hydrogen needs only 2, not 8, valence electrons to be satisfied. It is important to realize that electrons shared between two atoms count toward the total for both. Completing steps 1 and 2 will give you the structural formula of a molecule. To determine the shape of the molecule, you must consider the number of sites in which valence electron pairs surround the central atom. Since all electrons have the same negative charge, they repel each other. The valence electron sites will arrange themselves around the central atom to be as far from each other as possible. There are two types of electron pair sites: those that contain electron pairs in a bond and those that contain unbonded electron pairs (also called lone pairs). The number of total electron pair sites and number of lone pairs will dictate the molecule's shape. This molecular geometry is called tetrahedral. The molecular shape you see is not exactly a tetrahedron; it's more of a pyramid. This molecular geometry is known as a trigonal pyramidal. See why? The shape is a pyramid, so it's pyramidal; the base is a triangle, so it's trigonal. Now look at water's molecular structure. It's another variant of the tetrahedron, but with two corners occupied by electron pairs. This molecular geometry is known as bent. The angle between O–H bonds is about 105°. The central molecule need not have four electron pair sites. If it has two, the molecular geometry will be linear, with 180° between bonds. If it has three electron pair sites (and no lone pairs), the sites will be 120° apart and the molecular geometry is trigonal planar. Planar means that the molecule is flat or two-dimensional. If there are three sites and one is a lone pair, the shape resembles that of the water molecule and is also called bent. You should also be aware of two elements that violate the octet rule. Beryllium (Be) atoms are stable with 4 valence electrons. When beryllium is the central atom, the molecule is linear. Boron (B) atoms strive to gain 6 valence electrons. When boron acts as the central atom in a molecule, the shape is generally trigonal planar. We talked earlier about covalent bonds being polar or nonpolar, depending on the electronegativity difference between the bonded atoms. Well, molecules can also be polar or nonpolar. How can you tell if a molecule is polar or nonpolar? If the molecule is diatomic, it's easy: Any diatomic molecule that has a polar bond is polar, for example, CO. Any diatomic molecule that has a nonpolar bond is nonpolar. 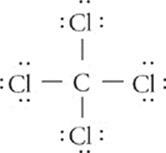 For example, all elemental diametric molecules, such as Cl2, N2, and O2, are nonpolar. Otherwise there will be some electronegativity difference that makes the bond, and thus the molecule, polar. Molecules that consist of three or more atoms are generally polar unless the following condition is met: If the central atom has no lone pairs and is surrounded by atoms of one element, then the molecule will be nonpolar, for example, CO2. In these cases, the individual bond polarities cancel each other out. So it's possible for a molecule to contain polar bonds but, itself, be nonpolar. Methane is an example of this. The individual polarities from each C–H bond cancel each other out, making CH4 nonpolar. Also note that methane satisfies our condition for being nonpolar: The carbon central atom has no lone pairs and is surrounded by atoms of one element (in this case, hydrogen). In order for a molecule to be polar, polar bonds must line up so that the more electronegative atom or atoms are at one end of the molecule, and the less electronegative atom or atoms are at the other. Whenever polar bonds are arranged symmetrically around a central atom, the polar bonds cancel each other out, and there is no positive or negative end. Look back over what we've discussed since the last question set, and then try to answer the following questions. Answers can be found in Part III. Questions 14–16 refer to following. 56. How many single bonds are in a molecule of carbon dioxide, CO2? · The rows of the periodic table are called periods; the columns are called groups. · Elements in the same period have the same number of electron energy shells. · Elements in the same group have the same valence configuration and similar chemical properties. · The periodic table is arranged to keep together different groups and their qualities. 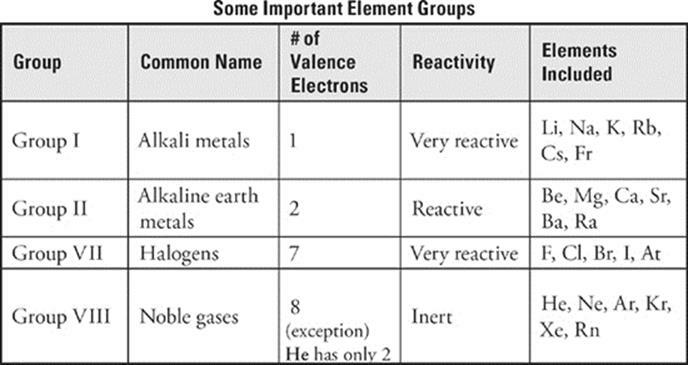 · Elements in Group I, the Alkali Metals, have one valence electron, and are very reactive. · Group II is the Alkaline Metals, which have two valence electrons and are also very reactive. · Group VII consists of the Halogens, which range from gas to solid, have 7 valence electrons, and are very reactive. · The middle section of the periodic table contains the transition metals, which have electrons in the f and/or d subshells. · All metals share certain physical properties, and all tend to give up electrons when they bond. · The upper-right section of the periodic table holds the nonmetals, which have valence electrons in the p subshell, and tend to gain or share electrons in bonds. They do not conduct heat or electricity well, and have low boiling points. · Semimetals have physical properties of both metals and nonmetals, and form the boundary between the two on the periodic table. · Ionization energy, or the energy required to pull an electron off an atom, increases from left to right across the periodic table, and as you move up a given group. · Electronegativity is a measure of how strongly an atom pulls on electrons in a bond. It increases from left to right, and as you move up the table. · Atomic radius increases down and to the left on the periodic table. · When a metal and a nonmetal combine, the metal completely loses an electron or electrons, and the nonmetal completely gains them. The two ions are held together by force of attraction between opposite charges in an ionic bond. · A covalent bond is a bond in which electrons are shared, usually so that each atom in the molecule achieves an octet. · A polar bond is a covalent bond between atoms of differing electronegativities. The more electronegative element pulls more on the electron, giving it a partial negative charge, and the less electronegative element a positive one. · A nonpolar covalent bond is a covalent bond between two of the same atoms or two atoms with the same electronegativity. The atoms share electrons equally. · Areas that contain electrons, including bonds and nonbonding electron pairs, repulse each other. This repulsion determines molecular shape. 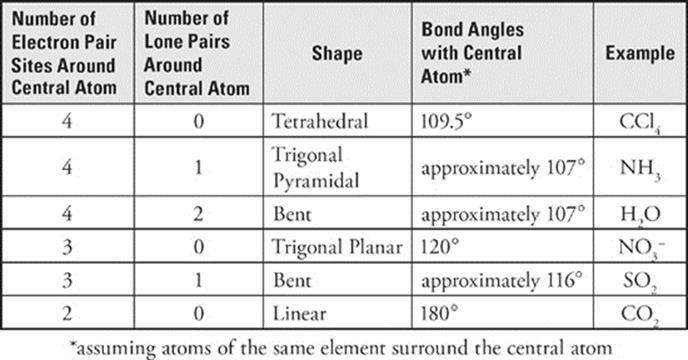 Common molecular shapes include tetrahedral, trigonal pyramidal, trigonal planar, bent, and linear.